Fig. 5.4. Classification of clonal growth types based on Central European vegetation (Klimes et al., 1997; with permission of Backhuys Publishers). Table 5.3. Definitions of structures common in clonal species with weed examples. Canada thistle, Cirsium arvense Field bindweed, Convolvulus arvensis over 70% of monocot families are predominantly clonal. When considered on an area-covered basis, clonal species are important. For example, the ten most widespread species in Britain are clonal and together they cover 19% of the landmass (Callaghan et al., 1992). While individual ramets may have shorter life spans, genets may survive for thousands of years and cover thousands of square metres (Cook, 1985). Clonality is common in perennials but not annuals or biennials. Many of the worst weeds are clonal. Clonality is a successful strategy in stable but harsh conditions, such as in the Arctic (van Groenendael et al., 1996; Peterson and Jones, 1997). Historically, clon-al families have had greater success during periods of climatic stress. Their current distribution reflects their habitat preferences. For example, in Central Europe, clonal plants tend to be in colder, wetter, nutrient poor habitats (KlimeS et al., 1997). Fig. 5.5. 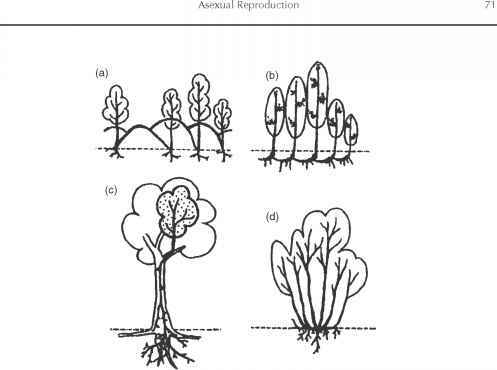 Examples of how clonal growth occurs in woody plants. Shown are (a) layering from drooping branches, (b) sprouting rhizomes, (c) reiteration by aerial shoots or from within roots, (d) basal rooting of coppice shoots, (e) suckering from root buds, and (f) rooting of freehanging roots (Jenfk, 1994; with permission of the Institute of Botany of the Czech Academy of Sciences). valvis), for example, produces rhizomes and corms in addition to flowers (Cheplick, 1995). Clonal reproduction of woody plants long has been exploited by nursery workers. It allows growers to bypass the stages of seed production, seed germination and seedling establishment, decreasing both the time and mortality rate inherent in these stages of growth. 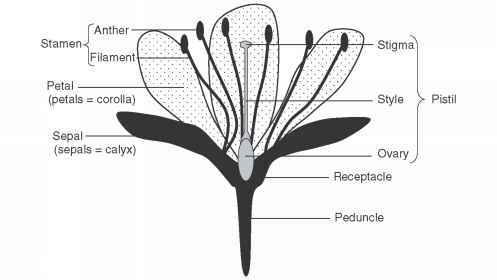 The mechanisms of woody clonali-ty differ somewhat from herbaceous clonal growth. New ramets develop from woody individuals either when shoots (trunk, branch and twigs) bear a root primordia, or when roots bear a shoot bud (Fig. 5.5). The most common types of clonality in woody plants are through sprouting of roots (root suckers) and from layering of branches and stems when they come in contact with soil. Root suckering is exhibited almost exclusively by angiosperms, whereas gym-nosperms are more likely to layer. Table 5.4. Costs and benefits of vegetative reproduction. Lack of genetic recombination through sexual reproduction means the benefits from novel genotypes are lost Spatial integrity of clones can make them more vulnerable to large scale disturbances such as floods, fire and frost heave Nutrients are shared among ramets, therefore survivorship of an individual ramet may be decreased in favourable habitat A disease may be able to spread throughout the portions of a genet that remain connected The creation of new clones decreases the allocation of resources to sexual reproduction tion (Table 5.4). One of the main benefits to clonal growth is that it allows the individual to bypass the juvenile stage of growth necessary for individuals that reproduce by seeds. The seedling stage is often where the highest mortality occurs for plants. Thus, new clonal individuals have a higher growth rate, lower mortality and can take up 'biological space' that might otherwise become occupied by competitors. A second general benefit to clonal growth is that new ramets can move into other habitats allowing the genet to invade new space or enter into a better environment while maintaining a presence in the 'old' habitat. The main cost to clonal reproduction is that there is no new genetic recombination, which reduces an individual's ability to adapt to new environments. In addition, if ramets remain attached, it more likely that the entire genet may be killed by disturbance, disease or herbicides. Two general types of clonal growth are guerrilla and phalanx (Lovett Doust, 1981) (Fig. 5.3). Guerrilla-type growth forms loosely packed, often linear patches. Guerrilla growth is a foraging strategy that maximizes movement of a species into new habitats. Such species are likely to invade new habitats and vacate other ones over the course of a season (Hutchings and Mogie, 1990). For example, at your local golf course or in your own lawn, redtop grass (Agrostis stolonifera) will spread by sending ground level stems (stolons) into an area that is occupied by other plants. Once there, the stolons produce new shoots that, in turn, produce more stolons for further colonization. At first, only a few stems of redtop grass appear as if by stealth, but eventually the habitat area is taken over as more stolons and shoots are produced. Phalanx-type growth is the result of slow growing, branched clones which form dense patches. Phalanx growth exploits space by maximizing the occupation of a site and deterring invasion from other species. Such species form dense monocultures with individuals of approximately equal size. Patches have little movement over the course of a season (Hutchings and Mogie, 1990). Often, peripheral (younger) ramets are dependent on interior (older) ramets for resources while interior ramets flower and set fruit (Waller, 1988). Quackgrass spreads in a phalanx pattern. Clonal species often have the ability to persist at the edges of their distribution because they are not dependent on sexual reproduction. This pattern is thought to occur because seed production requires higher temperatures than clonal growth, and because fewer appropriate pollinators are found in stressful habitats (Abrahamson, 1980). Japanese knotweed (Fallopia japonica), for example, is distributed widely in northern Europe and North America, and yet seed production has never been observed in places like Britain or the USA (Brock et al., 1995). Therefore, preventing seed production may not be enough to eradicate a weed because it may survive and spread through clonal growth. Clonal species may form remnant populations when conditions become unsuitable for seed production. Arctic dwarf birch (Betula glandulosa), for example, forms clonal stands at the northern edge of its distribution in sites where the species was once widely distributed (Hermanutz et al., 1989). Even populations that appear entirely clon-al may revert to sexual seed production when conditions improve and isolated clon-al stands can act as seed sources for recolo-nization when conditions improve. Whorled wood aster (Aster acuminatus) remains in small clonal populations under forest canopy, but produces seed when a canopy gap opens (Hughes et al., 1988). Woody plants that are clonal benefit from better physical stability and protection from most risks (e.g. fire, wind and herbivores) (Peterson and Jones, 1997). Peripheral ramets may protect inner ones by buffering them from damage. In addition, if a disturbance removes the above-ground biomass, then sprouts from an existing rootstock will provide a 'sprout bank' (Ohkubo et al., 1996). Species with root sprouts have a better chance of establishing than species reliant on seeds. Ramets may remain physically attached through connectors (e.g. stolons or rhizomes) or they may fragment into independent parts. The degree of ramet integration can vary from highly integrated compact patches to fragmented genets forming only loose associations. Separation of ramets occurs naturally when specialized tissues (called 'plantlets') are abscised or when parts of the plant are separated through decay of the tissue that connects them. Separation also occurs through fragmentation caused by disturbance. In agricultural systems, for example, tillage will fragment quackgrass rhizomes. Table 5.5. Costs and benefits associated with maintaining physiological integration among ramets (based on text in Jonsdottir and Watson, 1997). (Table 5.5). When ramets remain integrated, they continue to share resources. For example, older established ramets may support younger ones, during early establishment, by sending resources to them. Integration benefits the entire genet because it increases the longevity of the clone and prolongs the occupation of the site. The benefits of remaining integrated increase in heterogeneous environments (Wijesinghe and Handel, 1994). Genets with integrated ramets effectively live in two or more places at once, because each shoot section is anchored in a different microhabitat (Alpert and Stuefer, 1997). Having multiple rooting sites reduces the risk to the intact genet, because resources can be shared between ramets and, therefore, ramets in poorer sites are supported by ones in better sites. Sharing resources may result in less biomass accumulation of individual ramets, but total biomass of the genet will increase. Genets that remain integrated are typical of nutrient poor environments (van Groenendael et al., 1996). Integrated clones tend to interact more intra-clonally than with other species. Ramets of woody species remain integrated for long periods of time and this results in woody clones being long lived and spreading extensively. In fact, the largest plant is argued to be a clonal patch of trembling aspen (Populus tremuloides) found in Utah, USA. A single male clone contains approximately 47,000 trees (ramets) and covers 43 ha (Grant, 1993). typic plasticity. This allows genets to exploit nutrient-rich sites by rapidly increasing ramet density in a localized microhabitat (Hutchings and Mogie, 1990) or modifying root and shoot structure to optimize resource use within their environment (de Kroon and Hutchings, 1995; van Groenendael et al., 1996). Genets are more likely to fragment in nutrient rich environments and this allows them to colonize and monopolize large tracts of land. Examples of fragmenting species include bracken fern, (Pteridium aquil-inum), Kentucky bluegrass (Poa pratensis) quackgrass and white clover (Trifolium repens); these all form larger patches in open habitats with adequate moisture (Jonsdottir and Watson, 1997). In heterogeneous environments with both nutrient-rich and nutrient-poor microhabitats, the genets may fragment but the fragments are much smaller in size because the microhabitat is smaller than in consistently nutrient-rich environments. Tall goldenrod (Solidago altissima), Canada goldenrod (Solidago canadensis), eastern lined aster (Aster lanceolatus) and New York aster (Aster novi-belgii) are examples of species that produce small fragments and form small patches in moderately disturbed, shaded environments. While fragmented genets allow for greater colonization, the trade-off is that such species are less likely to spread to new, favourable habitats because they concentrate their resources in one place (Hutchings and Mogie, 1990). The lower colonization ability is ironic because fragmented genets often must be better interspecific competitors than integrated genets. Table 5.6. Expected differences between asexually produced and sexually produced offspring (adapted from Williams, 1975, and Abrahamson, 1980). High mortality rate - especially during seedling stage. This occurs because when ramets fragment, the genet will encounter other species more often than its own ramets.